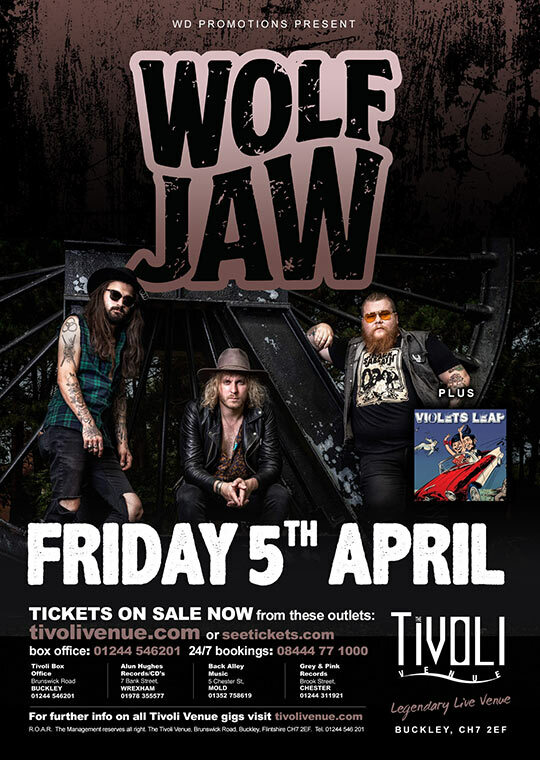 WOLF JAW is the new name for Midlands rockers The Bad Flowers. The Bad Flowers formed from the depths of The Black Country (Cannock) in 2014 comprised of Lead vocalist and guitarist, Tom Leighton, who’s riffs, fuzz emotive guitar and pure vocals have distinctive sound unlike anybody else. Bassist, Dale Tonks, provides a deep heavy groove and tasty bass runs that under pin Karl Selickis’ chest pumping drums and impeccable feel. The combination of the three makes The Bad Flowers a force to be reckoned with, forging a sound steeped in the raw, passionate energy of the Black country’s 70’s heroes but all the time keeping it in this century. This combination of raw power, passion and nostalgia has created a sound that’s is described as Thunderous Rock’n’Roll by there loyal fans and reviewers alike. You can be sure that every time this power trio hit a stage your in for a rollercoaster of riffs, solid grooves and choruses that will have you singing all the way home and forever more, they make sure you don’t forget them in a hurry. In the formative years of 2014/15 The Bad Flowers rose to local fruition with their energetic live shows in the local pubs, clubs and venues cutting their teeth with the local older & experienced musicians and soaking up as much stagecraft as possible, also releasing Vicious Lullabies EP & Killing Time EP’s. 2016 saw a self titled EP including songs such as ‘City Lights’ and ‘Big County’ both of these songs were written whilst the band were on the road in Europe for their first continental shows in Austria and France, the EP also included ‘Can you Feel It?’ And ‘Run, Run, Run’ both high tempo modern tales of frustration. That same year was a break through in terms of live shows too, Leaving the local venues in a wake of blood, sweat and ringing ears the band had the opportunity to open for Canadian rockers The Sheepdogs in Birmingham, then onward to extensive tours up and down the UK to packed venues with Crobot, Jared James Nichols and Scorpion Child as well as appearing at Hard Rock Hell festival. The Bad Flowers meteoric rise to fame kicked off when the band released their critically acclaimed debut album ‘Starting Gun’ in February 2018. The album spawned to radio tracks on Planet Rock Thunder Child and Hurricane. The band embarked on a UK tour supporting Stone Broken and Jared James Nichols the same month. Last summer, the Bad Flowers played several music festivals including Steelhouse, Stone Free, Hard Rock Hell, followed by Planet Rockstock in December. The name change came about in 2018 with great plans for the future. Be a part of it and catch them at the Tiv!